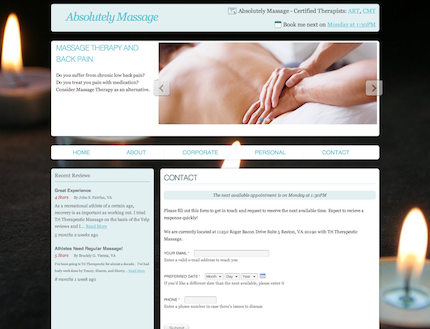 Absolutely Massage is the product of Sherry, a certified Massage Therapist in Northern VA.
Daymuse is currently working to expand the company's web presence. AbsolutelyMassage.com is the virtual information and appointment tool for the leading ART certified massage therapy practice in the Northern Virginia region.Sherry Moeser graduated from AKS Massage Therapy School in Herndon, VA in January 2011. Sherry is certified by the National Certification Board for Therapeutic Massage and Bodywork (NCBTMB) and state licensed by the Virginia Board of Nursing. Sherry graduated from George Mason University with a B.S. in Event Management and Tourism and worked in the event planning industry prior to her massage profession.